This GoFundMe is aimed at optometrists who fit scleral lenses and patients who wear them. The Dry Eye Shop in Poulsbo, Washington has been supporting and educating scleral lens users since we began in 2005 (yes, we're heading into our 15th year!). 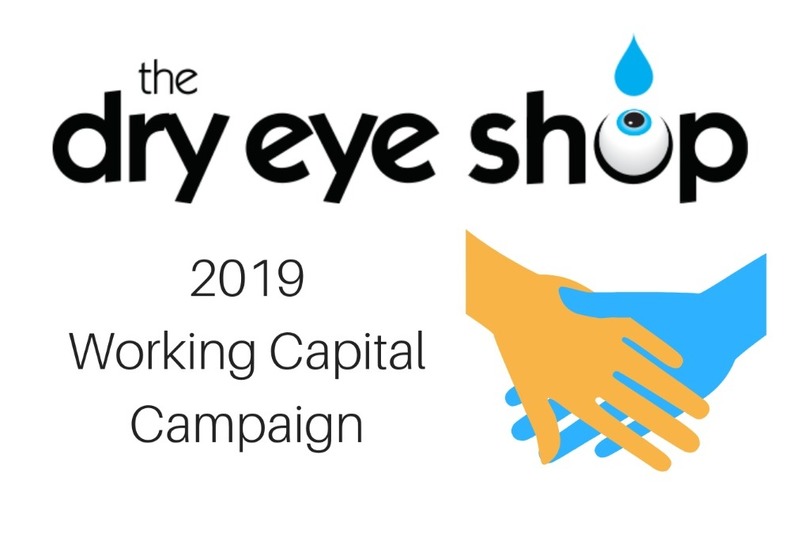 We are part of The Dry Eye Company, sister site to Dry Eye Zone and a mission-driven information and education center first, retail business second. We want to improve life for people with ocular surface diseases and those who wear scleral lenses to treat a variety of corneal diseases. Back in 2005, scleral lenses were a rarity that very few people knew about, and supplies were just a teensy part of the business, something we stocked as a service more than anything else. Since then, everything has changed. Scleral lenses have gone mainstream for keratoconus and many other needs and there are thousands of new patients using them. Our most frequent callers are scleral lens users in their first 6-12 months, whether or not they have dry eye. Needs are increasing and evolving all the time as these lenses are more complicated to use, by far, than any other type of contact. The information vacuums keep growing, and meeting these needs has become a key focus for us. For many patients, adopting scleral lenses is much harder, more complicated, and more stressful than their lens providers realize. Our data show that MANY patients struggle more than expected with the lens application and removal processes, with fogging and mucous, with procuring appropriate supplies (most of which are not sold locally, and some of which are chronically backordered at the manufacturer), with remembering which solutions to use when, and with recognizing the red flags that indicate they need to call their eye doctor. We provide a support system, information center, and to some extent even a safety net for your patients - who often find us totally by accident. They might be calling to buy a plunger, and find themselves in a discussion about their lenses, learning new tips, discovering they're using an inappropriate solution for their lens type, or learning why they need to call or return to their optometrist. - Track shortages of any products affecting scleral lens users and help everyone understand the substitutes. Current shortages are not too bad (mainly Menicon, and that should resolve fairly soon) but from 2015 to the present, there has been a steady stream of problems from salines to other supplies. The marketplace has not kept pace with scleral lens practice. - Run surveys, collect and publish trends we’re seeing amongst patients (see our Survey Center for some recent ones). - Raise awareness about issues that we believe patients may be experiencing but not reporting to their doctors. - Educate about safety risks, for example, the dangers of rinsing scleral lenses with water . - Educate about preservative-free saline solutions , which is a very poorly understood subject. - Coach patients with issues or concerns who call or who schedule phone consultations. We listen, talk through their concerns, and where appropriate send them back to their doctors armed with questions, about anything from lens fit questions to solution compatibility. Improving doctor-patient communications and relationships is an important goal for us. - Host a popular Facebook group, My Big Fat Scleral Lens , where patients can help each other troubleshoot and doctors can learn first-hand about common quandaries patients are having. - Provide subsidized or no-cost supplies on a case-by-case basis to fixed-income patients for whom sclerals are a medical necessity, and funnel donations from generous customers to those who need them. - Make videos about the purely practical aspects of using the lenses. Oh yes, and we sell stuff too, of course. Our scleral lens product section is chock full of practical information, Q&A, reviews and articles. No, we are not as cheap as Amazon, nor do we have free shipping (except through our annual free shipping plan) because we're not a monolith. But patients can call and talk to a real person, and can place orders over the phone rather than online. They can set up automated shipments at a discount. They can email us, text us, chat with us, contact us via Facebook. Most of all, they can ask all kinds of questions. If the questions are appropriate for us, we handle them, otherwise we gently steer them back to their doctor. What we do, we do for love. DryEyeShop.com is not a money-making endeavor. (It could be. It’s just not been our focus.) No one is getting rich. In fact, we have lost money two years in a row. But all of our interactions with patients in these recent years as the scleral lens market has seen such rapid growth have abundantly proven the value of the role we are playing and make us even more determined to continue. We will do whatever it takes. We are making continuous improvements and corrections to our business model to ensure it's fully sustainable for the future, but we could really use some help re-building some working capital. Please consider helping! $25 each from 400 optometrists and patients would be a really big deal to us. WHERE WILL THESE FUNDS GO? It's all about reaching sustainability . We need our sales to be about 20% higher than they are at present. A key factor holding us back is lack of working capital to purchase new products - we have a mile long list of additional products we want to stock. Every new product we add becomes a new education process too, which is core to our mission.